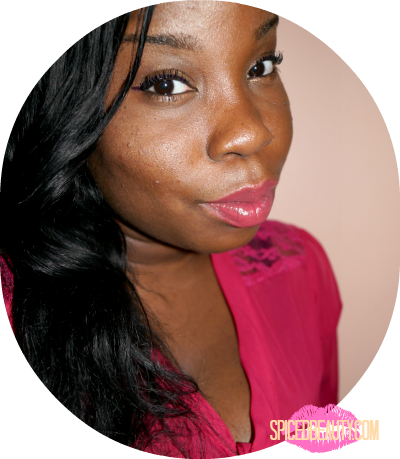 My signature look this year has been pretty simple- Wing liner & bold plum lips. It's quick and effortless. This post was apart of Challenge Four for Fashion magazine's Beauty Panel. I'm constantly asked how do I get my line so perfect. I will tell you it takes a lot of practice but a good eye liner is key. You can use pencil, liquid, cake or gel liners to get the look. For time sake, I use liquid liners. I also make sure I get the deepest black. I find it pops on my skin tone and also brings out the brown in my eyes. For this particular look I used Eye Tech Extreme Liquid Eye Liner from Milani. The liner is thin, pointy and deep. People who are new to eye liner may like it because it has a grip. If you still can't get your liner straight, make sure to have some precision qtips on hand to clean up the mess. There is a big difference between dewy and oily skin. I finally found a product that gives me that dewy look I want without making me look like an oil slick. It was actually a recommendation from the esthetician at Murale. After applying my Make up For ever Pro Finish, I spray Caudalie Grape Water in a "T" formation on my face. I love the look it gives off. It hydrates and refreshes my skin. I took a huge risk buying this product because I'm actually allergic to grapes.. Yea I know... I'm crazy. Since I'm not ingesting them, I'm okay. Don't Judge me!! 100 percent grape water toner enriched with moisturizing polysaccharides and mineral salts. For $12.00 I think it's a great buy because it works with my sensitive skin. 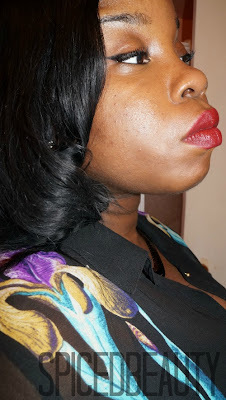 I was wearing the Caudalie Grape Water over MUFE pro finish here. Pastel are slowly creeping into my beauty collection. It's a trend that I think looks best on my nails. I recently had the opportunity to try out NCLA nail lacquers ($16) from Nailpolishcanada. I had no idea what to expect from the brand but I heard it's a celebrity favourite worn by Beyonce, Ke$ha and Miley Cyrus. Application was a tad difficult at first. A little streaky but I know that's common with creamy pastel colours. These polishes required three to four coats. As you can see in the picture above two coats was definitely not enough. The drying time was pretty quick but I know that building coats can be time consuming. If you have the patience, I would recommend these polishes. How amazing is this picture? It was taken while Jorge from Redken was spraying the models hair. I loved the fact that this look was one that you could wear daily. My favourite BB cream from Maybelline was used on the skin to give a dewy effect. 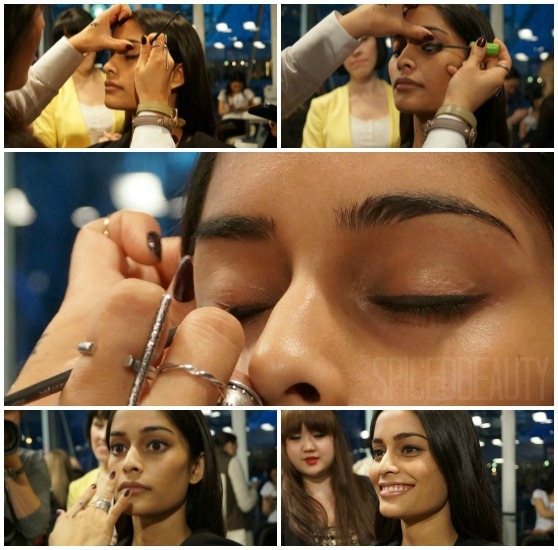 Eye Studio Lasting Drama Gel Liner in Blackest Black was used to line the upper lid. Maybelline Great lash was used on the lashes. Dream Bouncy Blush in Candy Coral was used on the cheeks. 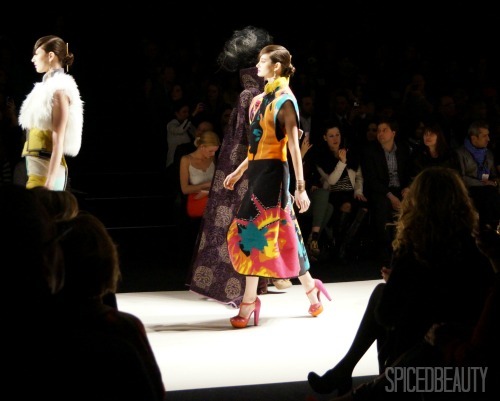 Grace Lee explained the look as "Tres, tres rocker chic"! 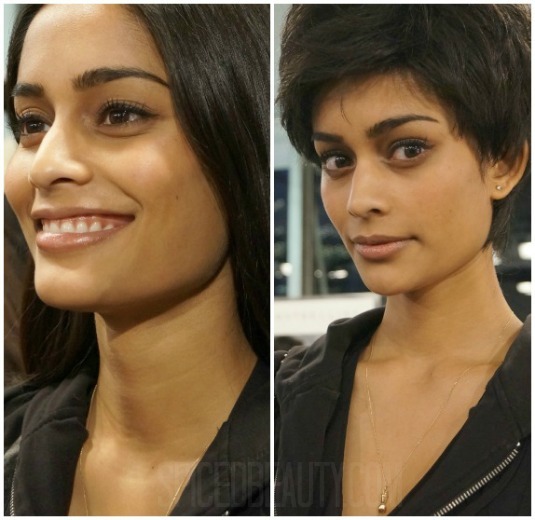 They cut the model's locks off to complete the look! I'm joking! Seriously though doesn't the wig look really natural. Jorge from Redken got the look by wrapping the hair using Fashion Works 12 and using bobby pins to compress it. Once the wig was on it was great to see them cut into it and use Wax Blast 10 & Fashion Works 12 to style it. It's crazy to see how much movement a wig can have right after coming out of a box. 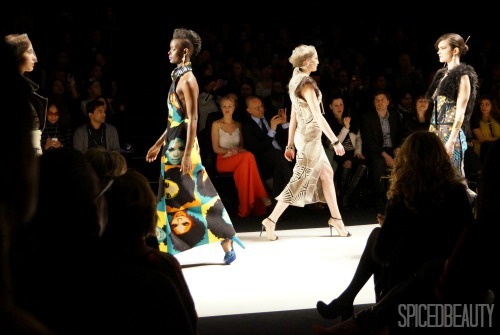 I can't wait to see what Joe fresh has in store for us next season! 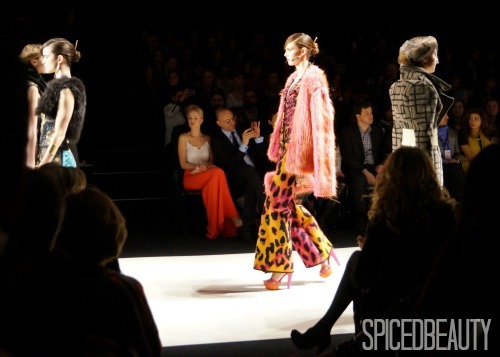 Toronto is buzzing with new trends, amazing shows and fresh faces! 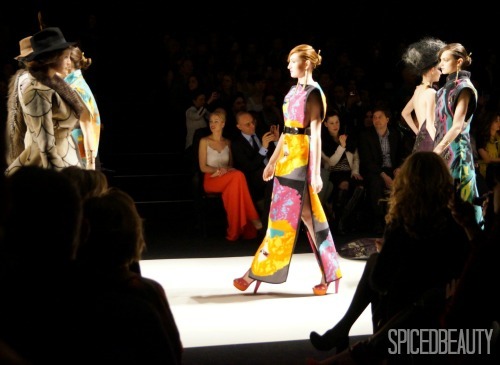 I had the opportunity to attend the KORHANI home Carpet Couture Runway Show. I was completely blown away with the precise tailoring and unique designs. I had to keep reminding myself that they`re wearing Carpet during the whole show! Check out some of the shots I captured! The first one is my favourite because it's creepy and invokes emotion. Can you believe that this is carpet? Last month, I had the opportunity to attend a really fun event at the Benefit Headquarters. While I was there, they unveiled the Benefit Colour Core collection for 2013. Doesn't the packaging remind you of that old Art deco feel? The line also features one of the hottest trends right now for spring/summer- Pastels! 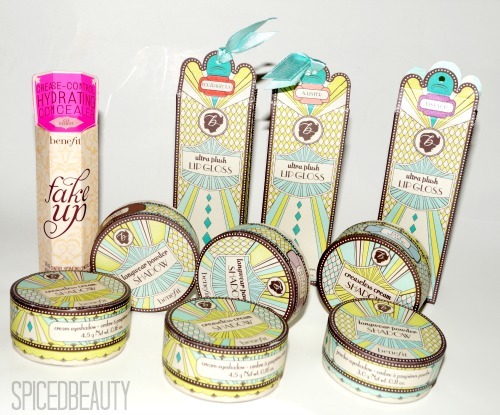 Thankfully, I was able to try out some goodies from the line courtesy of Benefit Canada! 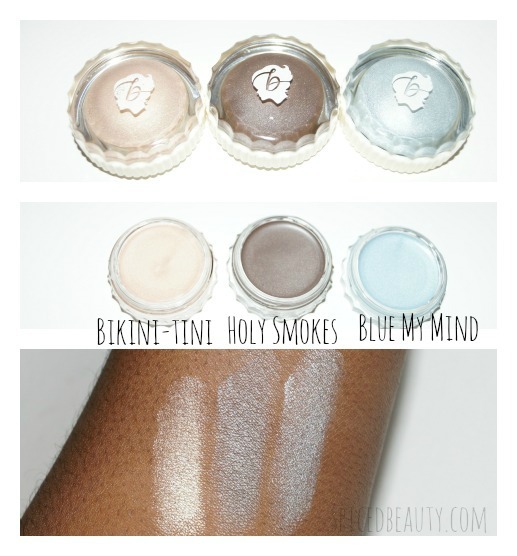 This soft & silky shadow comes in 12 wearable shades and three finishes: matte, satin and sheen. From pale shell to brilliant silver, we’ve got you covered! ..Crease-proof & budge-proof as ever! The 10 incredibly wearable shades (including original favorites r.s.v.p., birthday suit and skinny jeans) glide on easily and last all day long. 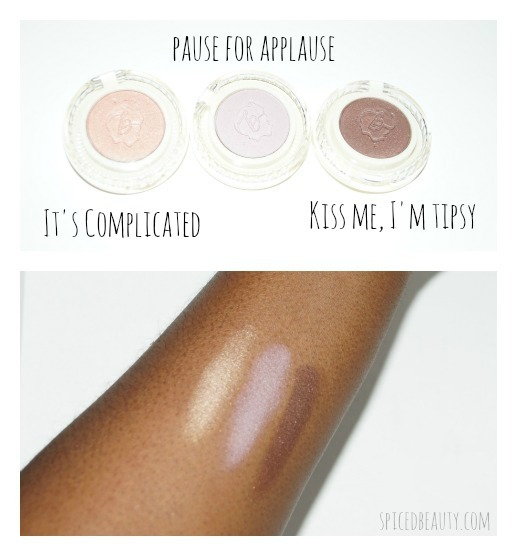 I know that this may sound crazy but I loved swatching everything in this post. I totally should start doing more posts like this. My favourite out of the bunch has to be the long wear powder shadow. Since I'm a dark/deep skin tone I didn't expect any of them to show up on me. The colours are actually really pretty. I feel like I want to incorporate Kiss Me, I'm Tipsy in every look. I couldn't have picked a better timing for this post! 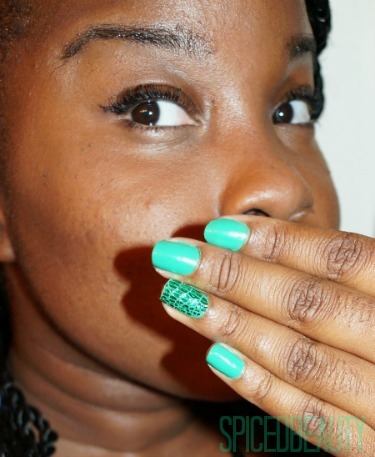 Green nails just in time for St. Paddy's Day! This post was apart of Challenge Two for Fashion magazine's Beauty Panel. 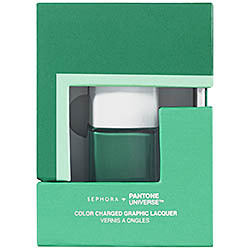 I used Sephora Color Charged Graphic Lacquer in Emerald ($12.00 CDN). 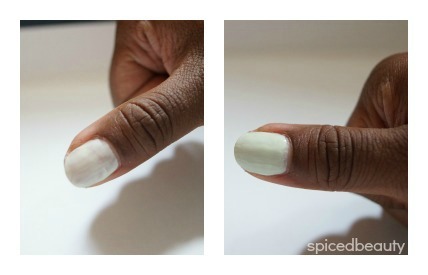 Can you believe I applied this with three coats (no base or top coat). To make my ring finger pop, I used Maybelline Color Show Nail Sticker in Divine Crocodile. 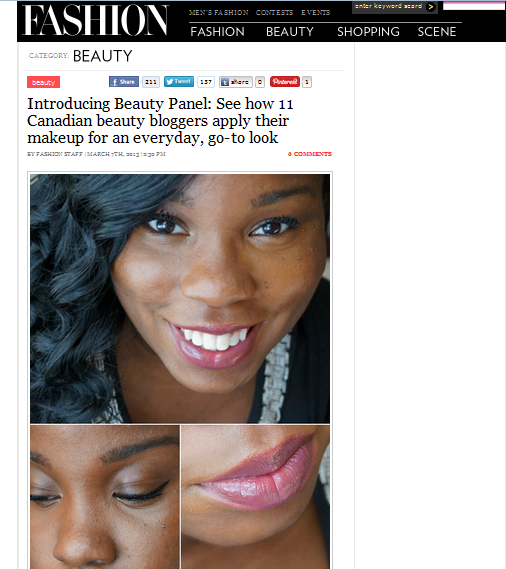 If you follow me on twitter, most of you know that I'm now a part of Fashion Magazine's Beauty Panel! What's beauty panel you ask? 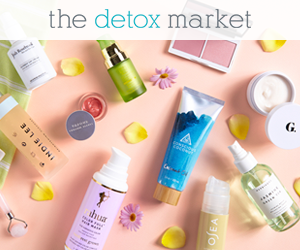 weekly questions dealing with makeup, hair & nails. I remember my first encounter with these brushes. It was at an Ulta in Buffalo, New York. My first time ever in Ulta and the real technique brushes were on sale. One base/flawless set was left and I told my friend that she could have it. that I know bloggers in USA and UK rave about. *More and more walmart locations are getting the brushsets and individual brushes- so don't fret if you can't get the set that you want at the moment. Another option for getting items you want is shopping online at farleyco.ca. I was sent the Real Techniques Your Base Core Collection. 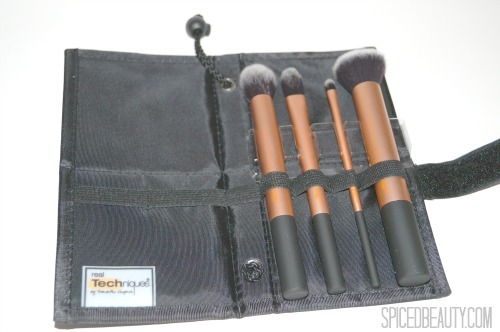 You can never go wrong with a great set of face brushes! Precision cut to effortlessly conceal problem areas; or, use with lipstick for long-lasting shape and definition. The brushes are soft but firm enough to get the job done. Synthetic taklon bristles are great for anyone with sensitive skin. - Plus they are good with wet & dry products. The case transforms into a stand- Perfect for someone like me who is always misplacing brushes. The brushes have the "usage" names on them. 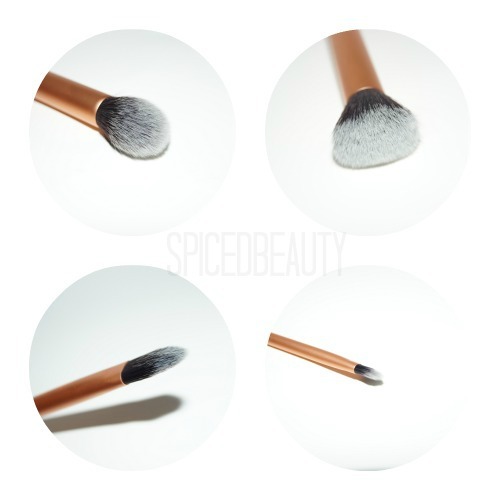 e.g "Contour Brush" - Always good for someone who is new to makeup. Last but not least they are 100% cruelty-free. Have you tried Real Techniques brushes before? It's been a while since I've done something on fashion trends. Let's get started with this trend: Thigh High Slits. I swear slits are one of those trends that will never die. They just start getting higher and higher! Being 5'2, I'm not sure if I'm going to embrace this trend this summer. Maybe I start out with a starter piece and go from there. Rihanna rocking an amazing dress from her river island line. Maria Menounos in a canary yellow dress at the Grammy's. Jennifer Lopez at the Grammy's look at that leg! Would you rock the thigh high slit trend? 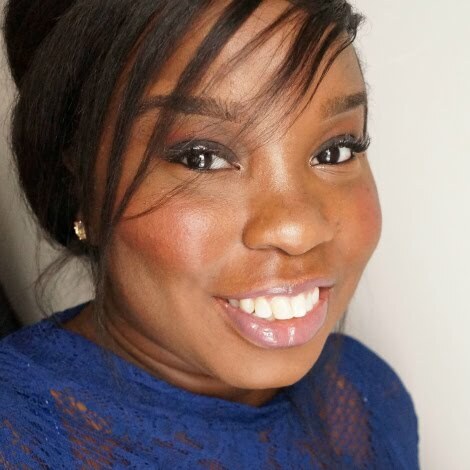 I couldn't wait to test out the Avon MagiX Cashmere Advanced Liquid Foundation ($15.00 CAN) because they had a great range for Women of Colour. That's one of the main things that attracted me to a line. I love the "squirt" bottle and applicator. 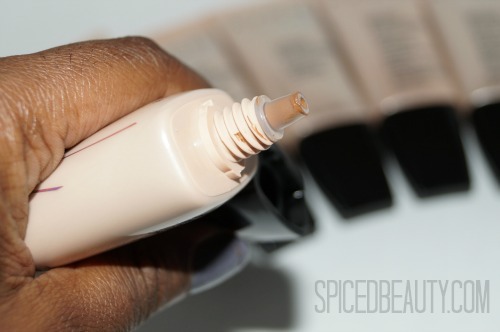 It's clean and easier to push out the amount of foundation you want without wasting it. 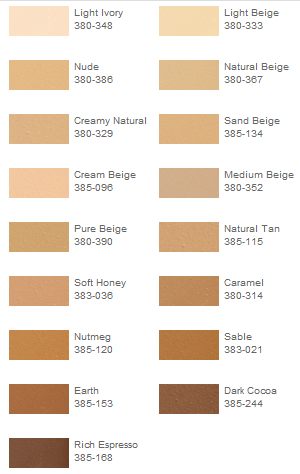 There are seventeen shades in the line ranging from light Ivory to Rich Espresso. So there is a shade for everyone! The formula is really smooth. They describe it as "cashmere-soft". A little bit goes a long way. It can be applied with a sponge, brush or fingers. 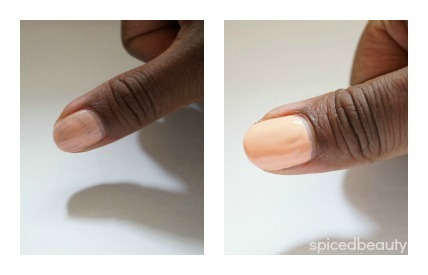 Lately, fingers have been my favourite way to apply foundation because I want a sheer finish. I will also use a wet sponge, if I want a sheer-dewy look. This foundation brightens up your face. It doesn't apply flat nor is it muddy. Must women of colour know exactly what I mean by that statement. 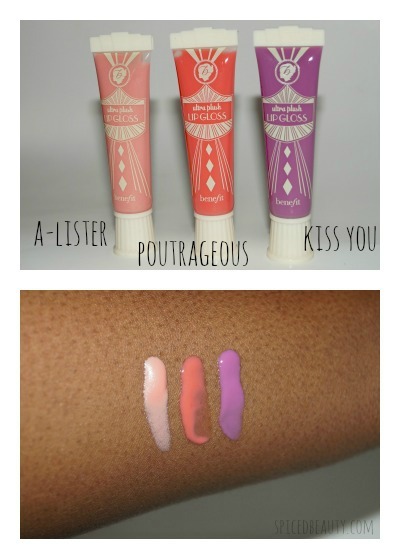 Wait until you see the swatches below! One of the great selling points of the foundation is how it how it creates a pore-free finish. I know a few ladies who have an issue with large pores. You don't need a primer if you use this foundation. 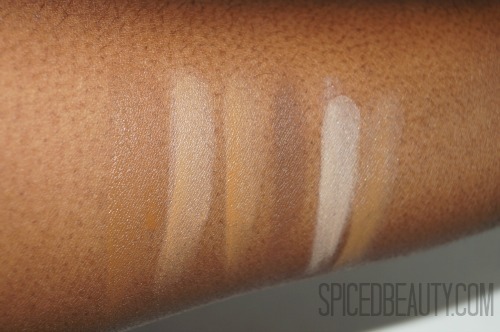 The three darkest foundations in the line- Rich Espresso, Dark Cocoa and Earth shades do NOT contain SPF. I do use a moisturiser which contains SPF- so the lack of SPF is not an issue for me. Also those three foundations would be perfect for special occasions where camera flashes were involved. 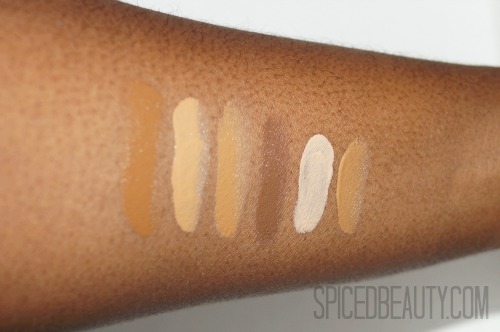 If you're an Make up Artist looking for an affordable foundation to add to your kit for darker tones, this would be a good start. Earth is a perfect match for me. It's blended on the left and you can't even see it. Love! 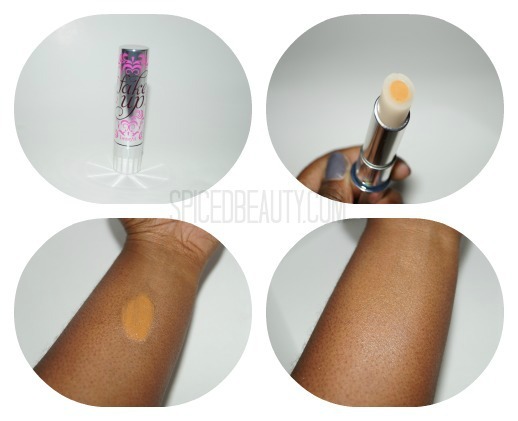 Have you tried foundation from avon before?